The tale of Shaktimaan moves ahead from the point where Shaktimaan brought back Appu successfully by overpowering the dark characters at Kilbish (aka Tamraj Kilwish)’s secret den. In other the incidents covered in this article belongs to Episode #15 onwards. We see that after saving Appu from the dark forces brings him back to his group of friends. Shaktimaan takes a wise decision and wipes out the memory of these incidents from Appu’s mind. The scene is small and you may miss it. But the psychological effects of the same (especially on kid’s mind) is something important and not to be missed. The director and writer both deserves appreciation for the scene, which they could have avoided, if they thought of the commercial angle only. It then follows by the incidents where children get very desperate to have Shaktimaan doll and Appu is not an exception. In fact he was very possessive about Shaktimaan and claims that he was the first one who saw Shaktimaan. He even tried forcefully getting Shaktimaan Doll from one of his friends. And the matter went to his elder sister Geeta. She scold Appu for the indecent behavior despite of loving him a lot. This scene affirms the fact that the elders have to behave as the guide for the younger. A guardian should stop strictly the person, when he is found going the wrong way. These moral and ethical values are the base of the society and screenplay have adapted it pretty well. Both the above mentioned scenes have one let down factor; and that is the poor acting and unconvincing dialog delivery of the kid playing Appu (and similar performance by child artist playing his friend too). The conversation between Gangadhar and Geeta provides some comic relief. It has the emotional quotient too. It was about Geeta’s feelings about her brother and Gangadhar’s try to cheer her up via some stupid stuff. The dialogs here are first rate and you see the superb comic timing of Kitu Gidwani. The chemistry between Mukesh Khanna and her is really works. It is followed by a couple of other comic scenes which are failed to irk laughter, but kids will find them entertaining for sure. The delightful stuff in the same episode is introduction to Santa Claus. Grandfather of one of Appu’s friend play Santa Claus on the Christmas day. And in the preparation for the he collected almost every Shaktimaan doll. He wanted to give it to the kid on the Christmas day and make their lives happier! The conversation here is really nice. The dialogs are well written and the scene is well executed too. Though it is not that; now everything is settled down on positive aspects. Kilwish and his aides are busy preparing new plans and enemies for mankind and Shaktimaan. Episode #16 focuses on this new enemy of Shaktimaan – the stoneman. It is Kapala who have created this powerful enemy for Shaktimaan. Kapala has a good plan. The stoneman have the capabilities to grow and shrink himself to the size desired. Kapala sends him to a small gift box at the place where the Santa Claus (now we know it is grandfather of a friend of Appu) was preparing for Christmas night. We must say the get up of Stoneman is very unconvincing. His suits fails making the impression that he is a stone man. The stoneman succeeds in making the Santa Claus a stone sculpture and deports him to Kapala. Now stoneman transforms himself into the Santa Claus and attend the party he was expected to. The party scene will be liked by the kids. The fight between Stoneman and Shaktimaan is not very convincing, but it is not bad also. 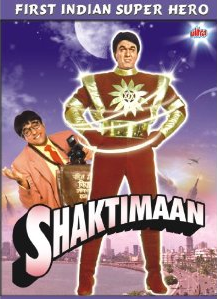 Stoneman however succeed overpowering Shaktimaan! And he thus takes him to Kapala. Whatever happens than after is the rest of this episode. The song at the party have meaningful lyrics. The dialogs are moral booster. The words of wisdom and humanity are found throughout. The script is inspired from a lot of Hollywood movies. The special effects are very poor as the matter of fact. There are some actors who act unconvincingly too. But, the good content and moral and wisdom orient content powerful act by some main characters makes it definitely worth watch. The main positive factor is the moral and ethical things the serial spread. It is definitely worth to watch for the same. As it is now available as the set of DVD, you shouldn’t miss it.